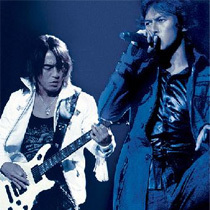 Hugely popular rock group B’z have sold over 75 million CDs in Japan. And now they are set to become the first Asian artists on Network Live. The US-based online service offers downloads of live performance video by the world’s top recording artists, including the Rolling Stones, Bon Jovi and Madonna. Kevin Wall, who was Executive Producer of last year’s Live 8, is the company’s CEO. The service is set to launch in Japan in June, and footage of the upcoming B’z show at the Osaka live house “Nanba Hatch”, scheduled for September 1, will be available on the new service in the autumn. The show itself will be a first for the band at such a small venue, and attended by 1,000 lucky fans selected from those who buy the new album “Monster”, due out on June 28. For those who can’t wait, the next single “Splash!”, out on June 7, will include a DVD with the first available footage of last year’s concert tour. The CD/DVD tieup is also a B’z first. • Former Fuji TV announcer Uchida Kyoko (29) and Yoshimoto Kogyo employee Kimoto Kimitoshi (32) are to hold their wedding ceremony and reception in July. The couple got married in March and were first introduced by comedian Hamada Masatoshi (42), one half of the Yoshimoto duo Downtown and a co-presenter of Fuji’s sports variety show “Junk Sports”. • Following yesterday’s story about forged Takarazuka tickets being sold on Internet auction sites, it seems Johnny’s Jimusho have been hit by the same problem. The agency handles almost all of Japan’s major boy bands and the fake tickets were for shows by three top artists during the spring. They were all photocopied from tickets sold through the Lawson convenience store chain and sold online. They were discovered at the concert venues. Like Takarazuka, Johnny’s artists enjoy huge fanbases and tickets can be very hard to find, leading to huge markups and huge potential profits for forgers. Buyers beware.